BR wrote: Great pictures and write-up Steve. I also have to say that the Zin you described does not sound at all like the place I have visited, but perhaps there have been changes for the worse. From the sound of things, I'd say the experience that one used to get at Zin is now being delivered in spades at Cuistot. The price points are quite similar, but both the food and service (as well as the ambiance) were far better at Cuistot. Zin seemed to be getting a bit rough around the edges. I don't have anything to compare it to because this was my first visit, but I trust your and Andy's taste so I can't imagine Zin being quite the same as it used to be. My parents retired several years ago to La Quinta (about 30 or so minutes from Palm Springs), so I'm out there at least a few times per year. And while it's typically easy to find a restaurant with a beautiful outdoor dining area, I find it much harder to get a really good meal, particularly one with anything that could be described as contemporary. And while there's Asian food, there's nothing I'd really call worthy. But one place definitely worth talking about is the very recently opened Figue Mediterranean Restaurant in La Quinta. My parents made the dinner reservation without my input, but in reviewing their website, one thing immediately caught my attention. The chef at Figue, Francois de Melogue, was previously the chef at Pili.Pili here in Chicago, a restaurant I loved but now miss terribly. He was also a chef at The Bakery here in Chicago. In any event, Chef Melogue seems to be putting out much of the same outstanding food he did at Pili.Pili. In fact, I might have enjoyed this meal more than any at Pili.Pili. As for food, we shared a few appetizers: a terrific Margherita pizza, which offered a beautifully charred crust and excellent quality fresh tomatoes and basil. There was also an excellent Mediterrano salad - feta, red onion, red pepper, olives, pine nuts and date leather (like a fruit roll-up in texture) - which had a nice sweet, salty, briny flavor combination and great quality ingredients. My favorite appetizer was either the pizza or the seared scallops served in a delicious carrot-saffron sauce. One other item on the menu that really caught my attention was the chickpea frites served as an accompaniment to the chicken tagine dish. One of my very favorite items at Pili.Pili was the panisse (i.e., chickpea frites). I asked if we could get them as a side, and they happily obliged. Interestingly, the owner was making rounds, and when he came over, he mentioned that no one had ever asked for the chickpea frites on their own, and he was curious what led me to want them as a side. I explained that I loved them at Pili.Pili and I knew the chef was from there. Shortly thereafter, Chef Melogue came over and said hello and was very appreciative of the kind words and talked about how he's essentially recreating and improving upon what he did at Pili.Pili in Chicago at Figue. More importantly, the panisse were every bit as great as I remember them being at Pili.Pili - thick, with a soft interior yet lightly crisp exterior, and with just the perfect seasoned chickpea flavor. I suggested they make these a separate item on the menu - they're just so addictive. 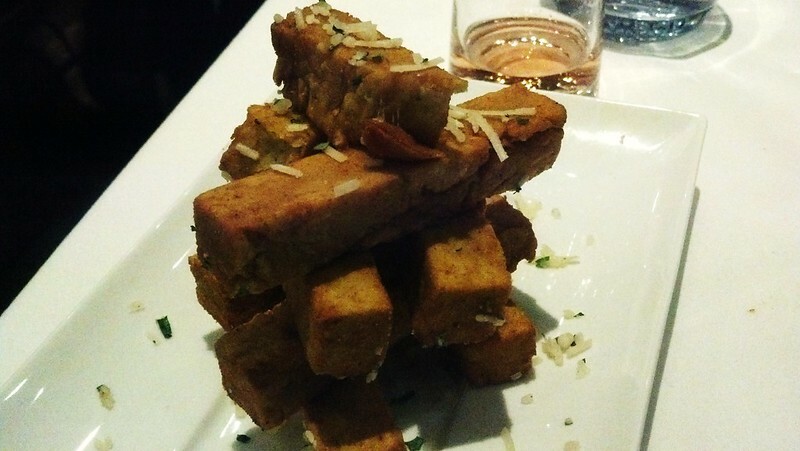 But to simply focus on the panisse would be a disservice to what they're doing at Figue. For my main course, I had the Fideua and it was also terrific. 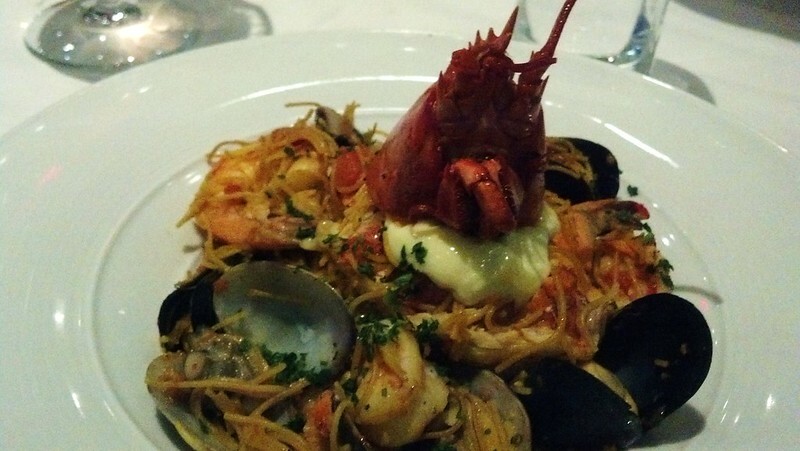 A very generous portion of perfectly cooked lobster, along with perfectly cooked shrimp and clams, rouille, all atop a saffron scented pasta. I also tasted some of my dad's gnocchi, which were light as a feather, and served with a delicious and rich pork and porcini ragu. Overall, a really outstanding meal and a must visit if you're in the area - a very short drive from the La Quinta resort and the Indian Wells resort, and less than 15 minutes from the Marriott resort. So although I continue to miss Pili.Pili, I'm happy that I'll once again be able to enjoy Chef Melogue's food, and probably a few times a year. I also found the revamped Morgan's menu very edible, even though people mostly associate it with resort food. Nothing on the menu is innovative or "street" or "global" or whatever the catch phrase is these days, but it was all surprisingly decent, more than it had to be. TonyC wrote: I also found the revamped Morgan's menu very edible, even though people mostly associate it with resort food. Nothing on the menu is innovative or "street" or "global" or whatever the catch phrase is these days, but it was all surprisingly decent, more than it had to be. I just ate there too. Those in the Midwest might be familiar with the chef, Jimmy Schmidt. And my understanding is that he is in the kitchen nightly - he was there on my visit. You're correct that it's not really innovative, but what impressed me with Morgan's on this visit was variety and quality of locally sourced vegetables, including artichokes, asparagus, morels, beets, favas, etc. In particular, I had an excellent risotto with asparagus and morels. I'm actually headed to Palm Desert this weekend for my niece's high school graduation (hooray for 100+ degree temperatures all weekend...). My only dining plans outside of In-N-Out is to try King's Highway at the Ace Hotel. It is described as an updated roadside diner with local or artisanal ingredients. lodasi wrote: I'm actually headed to Palm Desert this weekend for my niece's high school graduation (hooray for 100+ degree temperatures all weekend...). My only dining plans outside of In-N-Out is to try King's Highway at the Ace Hotel. It is described as an updated roadside diner with local or artisanal ingredients. How was it? Headed there for a long weekend over Labor Day, staying at the Ace, as friends are getting married there. It was insanely hot and unseasonably humid in PS this past weekend (100+ F days). Ate a few meals at King's Highway as it felt too hot to move around. Breakfast was fine. Their burger was pretty decent as well. Friends loved their chilaquiles and fried avocado dishes. The soy chorizo, not so much. Cuban sandwich was a little odd -- by house pickles they mean pickled ginger, for some reason. Cocktails were decent (free poured) with the Desert Facial being the best when you subbed in tequila for the vodka. I just returned from La Quinta last night from a visit to the parents, and yes, the humidity was like nothing I've experienced there before. I felt like I was in New Orleans. Anyway, we mostly stayed in and cooked, but I did make it to In-N-Out, which always makes me happy (my Dad and I went there right from the airport). I also made it to a new Korean bbq place, Maru, in La Quinta. Overall, not bad, particularly given the dearth of ethnic food in this part of the Palm Springs area. Bibimbap was solid, even if the meat was a bit dry. Seafood pancake a little greasy and not crisp enough for my liking, but still pretty good. Mandu had good flavor, but I didn't care for the cheap, won ton wrappers or the fact that they seemed deep fried (as opposed to pan fried) and too greasy. Banchan were okay but limited, but we didn't do any bbq items so I'm not sure if that made a difference (good kimchi though). As for the bbq items, you can cook them yourself at one of the grill tables (couldn't tell if it was charcoal) or they'll do it for you. Maru is on 111 in La Quinta, just east of Washington, and very accessible if you're in Palm Desert, Indian Wells, Indio or of course, La Quinta. My posts may not be particularly helpful for those staying in Palm Springs, but I usually visit my parents, who now live full time in La Quinta, which is anywhere from 30-50 minutes from Palm Springs depending upon the route you take -- much closer to Indian Wells and Palm Desert. My most recent visit was over Thanksgiving and not a lot of eating out. My first meal though was in Palm Springs, a rather upscale lunch at a beautiful restaurant named Spencer's. Unfortunately, everything we ate was positively awful. I can't remember too much except for a sweet potato soup that tasted nothing of sweet potato. Oh well. Perhaps the worst news of the trip was that my new favorite spot, Figue in La Quinta, is apparently now closed. I knew their were a lot of complaints about noise and that they had done some soundproofing that didn't quite seem to make a big difference, but the food was very good (see my earlier post above). They were also in a spot that has featured many other restaurants (that have also failed) and although they closed for the summer (as many restaurants do), they also never reopened -- sad because the desert is generally quite the plain meat and potatoes crowd and Figue was very unique for the area. Oh well. There is something to be said for classic French bistro food and La Brasserie in La Quinta is pretty much just that. Their French Onion Soup is terrific - rich and delicious with a terrific gruyere/bread crust. There was also a respectable serving of Escargot de Bourgogne. Less successful was my Frisee au Lardons, always one of my favorite bistro orders. Perfectly poached egg - check! Unfortunately, thin and crisp bits of bacon was a turn-off. For my main course, I had the Steak Frites and it was terrific - beautifully seared beef and great frites. All in all, a nice place with many classic bistro dishes. I really wanted to try the Cassoulet with Duck Confit and Toulouse Sausage, but I'm just not sure that this is the food I want to be eating there . . . maybe in a few weeks when it's slightly cooler weather there. 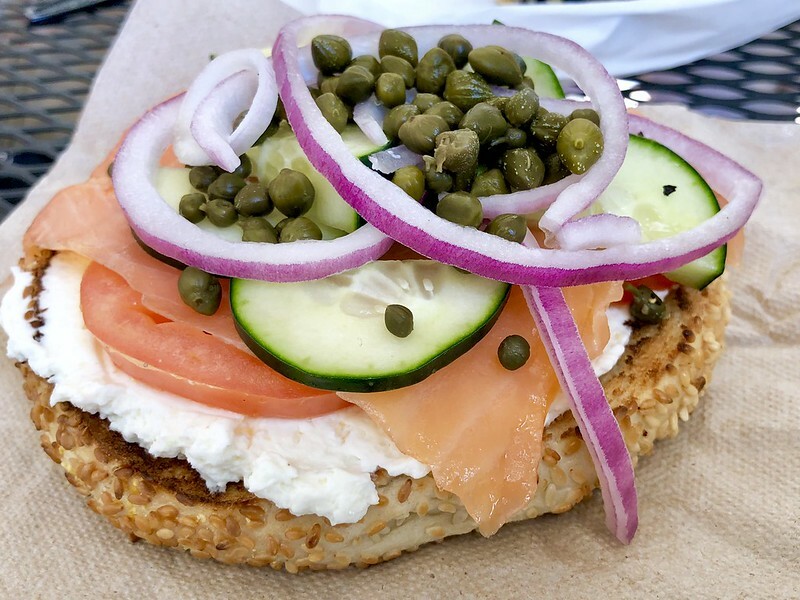 Perhaps my favorite thing at Old Town Coffee Company though is the Lox Sandwich - lox, tomatoes, onions, capers (cucumber added on my request) on a bagel. 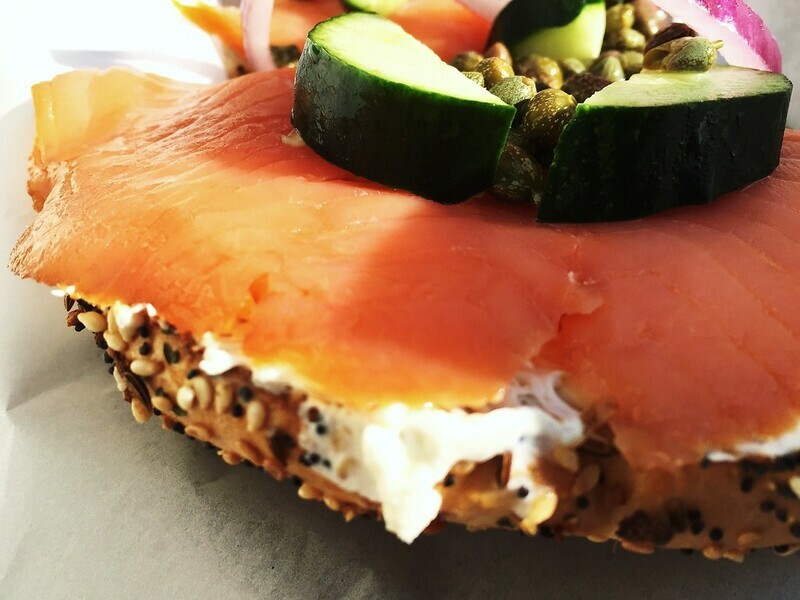 The bagel is pretty good and the lox is really excellent. Sorry for the lack of a better picture, but at least it gives you an idea. 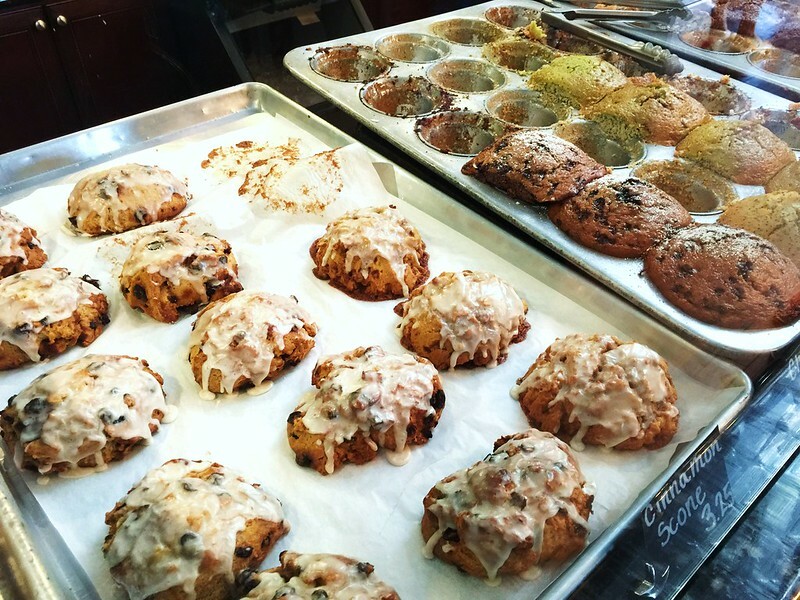 Admittedly, part of my love of this place is the abundance of outdoor seating, but I can't think of a better way to start my day than with a cup of coffee, a muffin or cinnamon roll (or both) and a lox sandwich on a bagel. Going to Palm Springs in May, anyone have any updates? Going out to the desert? Does it bother you how plain the food is out there? Well, it bothers me. There are a lot of inexpensive Mexican spots around Ramon Road, stretching from Palm Springs to Thousand Palms, but my parents are 30 minutes or so east in La Quinta, so these spots are out of my range. Near my parents, particularly as you head slightly east to Indio, you find some more Mexican, but a couple of holes in the wall I've tried haven't delivered the kind of joy I get from Mexican food here in Chicago. One exception is a large grocery store, Cardenas Markets, right in Highway 111 in Indio, which has a wonderful selection of fresh produce, tortillas, dried peppers, masa, lesser available cuts of meat, and many other ingredients you'd need to prepare a great Mexican meal. Maru Korean BBQ in La Quinta is conveniently located near my parents. I've been twice with family, but both were lunch visits with limited orders. But I would note that the pajeon and banchan were both solid, even if the banchan was a little light in variety. Pretty good kimchi too. Dolsot bibimbap could've offered more crispy rice, but this place offers enough to merit a return in the land of bland. Thai in this region offers little outside the standard American Thai offerings of Chicago, and often gets fused with Vietnamese or Chinese offerings . . . don't get your hopes to high. 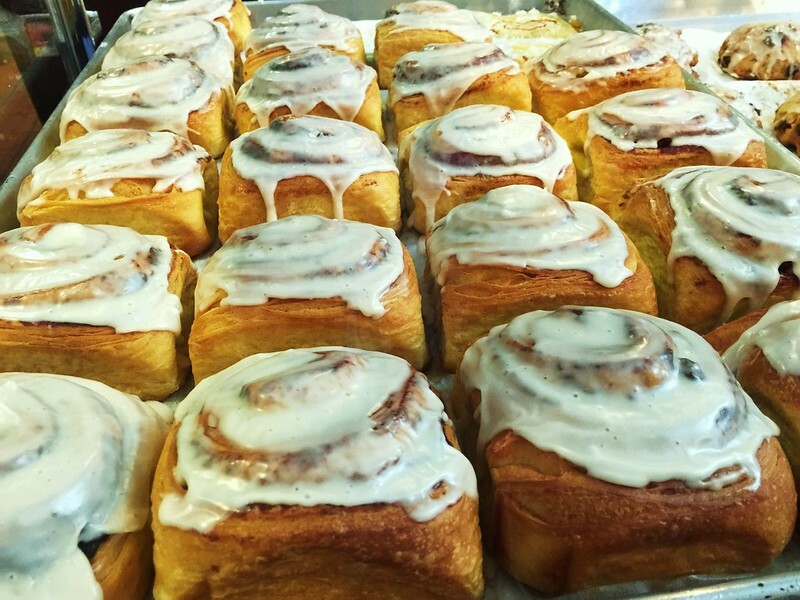 That's not to say the food's bad, but sweetness often interferes with more complex flavors. 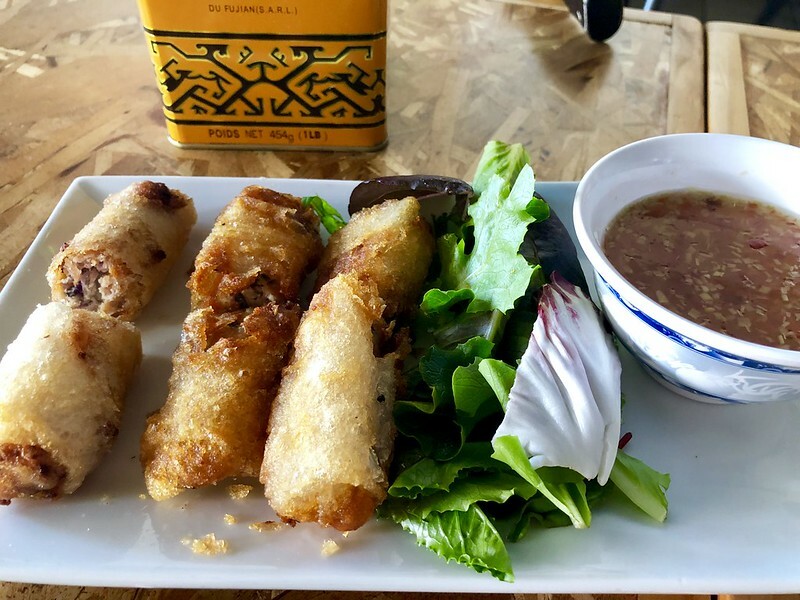 The best I've tried was at lunch at Talay Thai in Rancho Mirage several months back, where the flavors were better, more interesting, although I only shared a few items. Again though, Talay is on the fusion side of Thai, apparently offering dim sum on weekends. But this is pretty close to Palm Springs, and not very far from Palm Desert. Catalan Mediterranean is a Spanish restaurant in Rancho Mirage that left me disappointed. Paella was terribly heavy on paprika, featuring mushy rice and no socarrat. Two salads were no better, one too heavily dressed, the other featuring what was supposed to be a runny egg, but instead had a medium-boiled egg. I would've offered a lukewarm recommendation for the Vietnamese Pho Vu in La Quinta (now with a location in Palm Desert too), but one of the cooks left and opened up Pho of the Desert in Indio, which I enjoyed much more. Pho of the Desert has a much larger menu, more interesting options and just better prepared food. As for Chinese, generally boring . 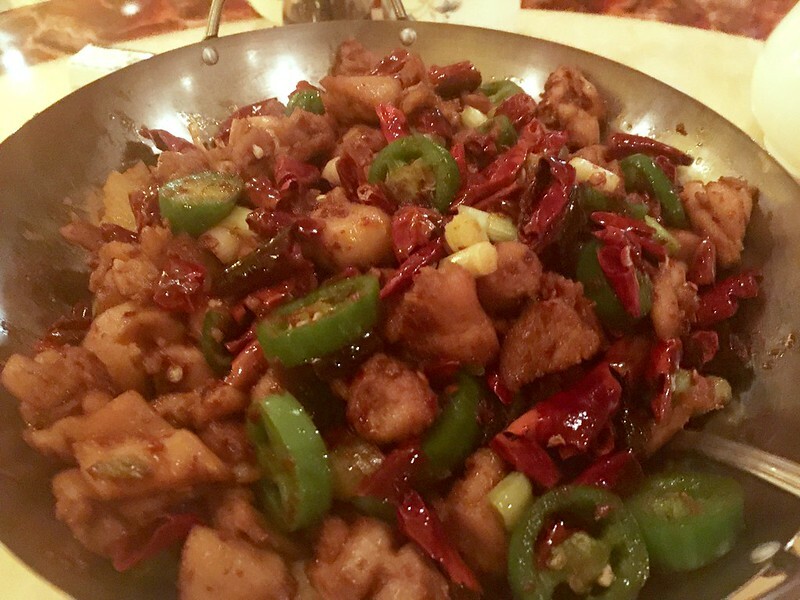 . . but there is one major exception, CIE Sichuan Cuisine in Indio. 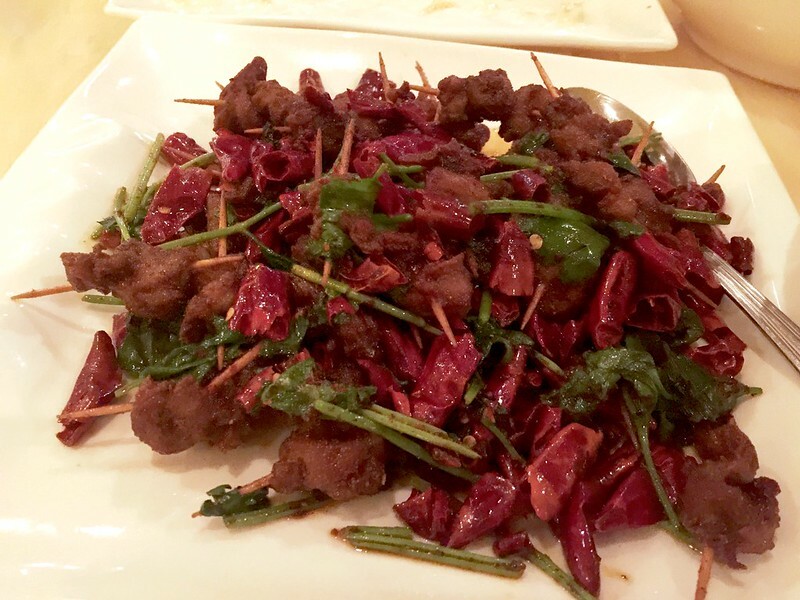 If you treasure real Sichuan food and find yourself needing an escape from the blandness of the desert, make your way here. But I'll save CIE for my next post. I think best bet in Palm Springs is to cook for yourself if possible. Or just drink. Sherman's Deli was much better quality (IMO) than Manhattan in the Dessert. 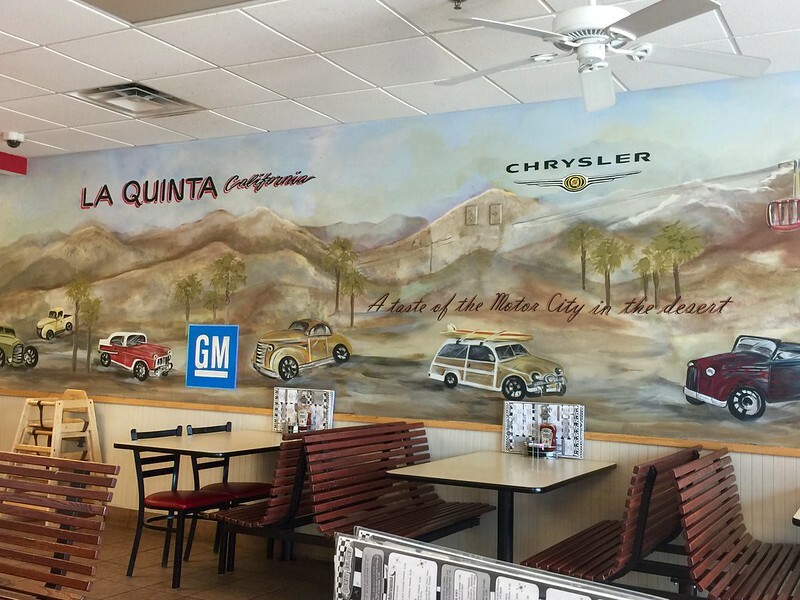 There are a number of location in the valley, we normally go to the La Quinta location as it is a bit larger than the other locations we've been to and doesn't seem to get as crowded (but it can get a rush). Generally a very large selection of fresh seafood. I nearly always get the fried clam strips, not bellies but the strips are very large. On other visits I'll then get a fresh grilled fish plate or sandwich. Just to manage expectations, Fisherman's is the type of place where you look at a big board of fantastically fresh seafood (for the desert), then place your order at a register, get your own drinks from a soda machine, and then take the number the cashier gives you to a table and sit down waiting for your order to be served. Don't want anyone to get the wrong idea and think it is a full service restaurant. I always get the lox platter at Michael's which is very good. 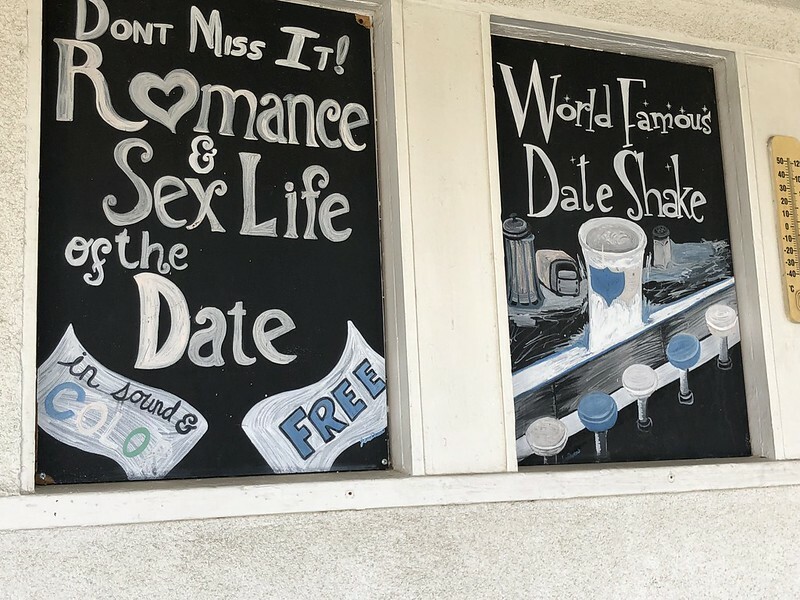 My husband and I have spent a couple of long weekends in Palm Springs and have managed to find some good (if not adventurous) places to eat. 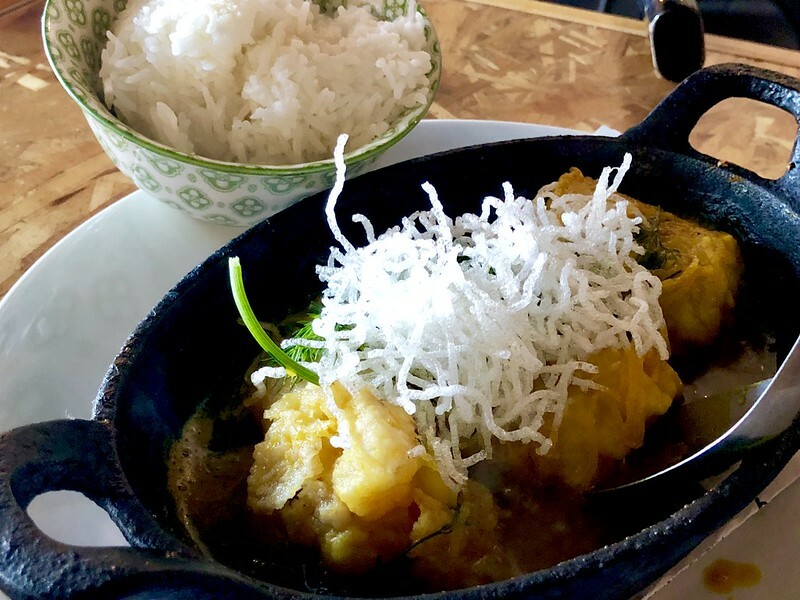 We consistently enjoy Workshop Kitchen & Bar and loved Rooster & Pig, the Vietnamese-inspired place owned by chef Tai Spendley (formerly of Chicago's Lula Café). Thanks for the tip bfolds. I don't get west to Palm Springs that much but I'll return to this thread for a reminder to give those places a try. Yes on Sherman's, particularly when compared to Manhattan in the Desert which is a disappointment. Sherman's is usually reliable. Fisherman's Market is just a few minutes from my parents' home. I've eaten there once, picked up fresh fish to cook at home another time. I was impressed on both visits, and I know my parents frequent the place and have usually been pleased. Lamb with toothpicks. This featured cumin, cilantro, smoky peppers, Szechuan peppercorns. I absolutely could not stop eating this. I've never tasted a better Szechuan lamb dish . . . no way. The toothpicks? Annoying, but I'd order this again without hesitation. Dan Dan noodles. An excellent version. Plenty of pork, not too liquidy. Oil studded with Szechuan peppercorns lurking below the noodles. A Szechuan chicken dish in a hot wok. Jalapenos, smoky dried peppers, more spicy oil, delicious. 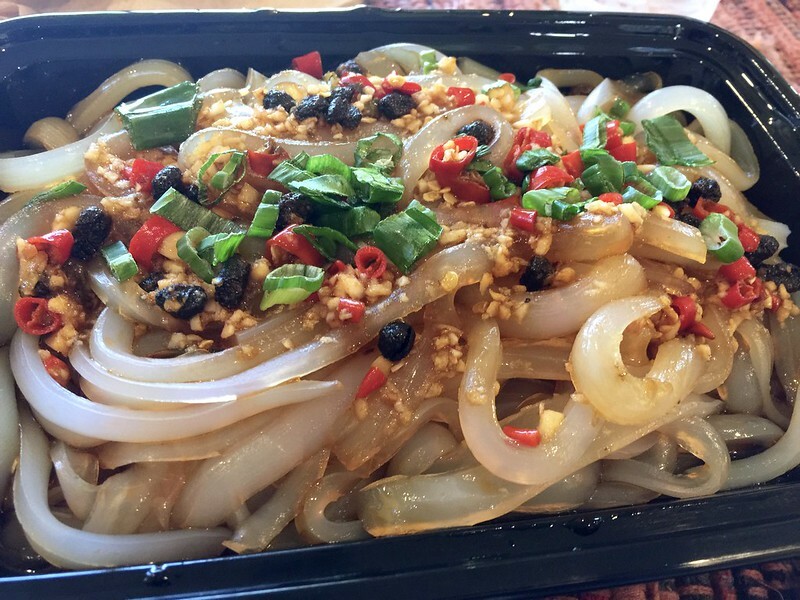 Cold dressing clear noodles. 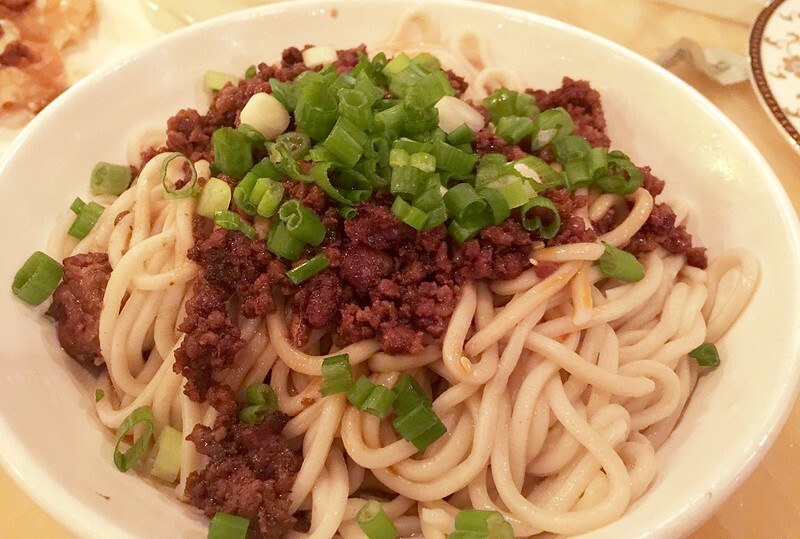 Not quite the Liang pi cold skin noodles I was hoping for but delicious nonetheless. A spicy oil with some Szechuan peppercorns, quite addicting. Mapa tofu was vegetarian and featured a sauce too similar to the clear noodle dish so I wasn't very enamored. We had a couple of vegetable dishes too (the above pics are from two dinners, one there and one takeout) but I don't have pics. But for those of you who love real Szechuan food and find yourself in the area (Indio is just east of La Quinta), make your way to Cie! In the last year, I've learned that I love Detroit coney dogs. I've tried both Lafayette and American in Detroit and thoroughly enjoyed both. Well, I recently realized that there's a place about 10 minutes from my parents' home that sells them, Bobby's Detroit Coney Island, in a strip mall in La Quinta right on 111. So I gave them a try. The Coney Dog was fantastic - all beef dog, really nice snap, good chili, mustard and onions. I'll be back. On my last couple of trips to the Palm Springs airport, I've visited Elmer's for breakfast. My parents are big fans. It's right on 111 and only about 10 minutes from the airport. Elmer's is a Pacific Northwest diner chain with most locations in Oregon and Washington. So think Denny's . . . but 100 times better. The German pancakes are just as you'd find at Walker Brothers. I also really enjoyed their bacon & Tillamook potato cakes and eggs. The potato cakes are nicely browned and crisped thick potato pancakes that are filled with bacon, Tillamook cheddar cheese and onions, and topped with sour cream. Their offerings seem far more interesting than the ordinary diner chain, including dungeness crab benedict. Also, on both visits, service has been fantastic. But note, on one of my visits we had to wait nearly 30 minutes for a table -- others apparently like it too. 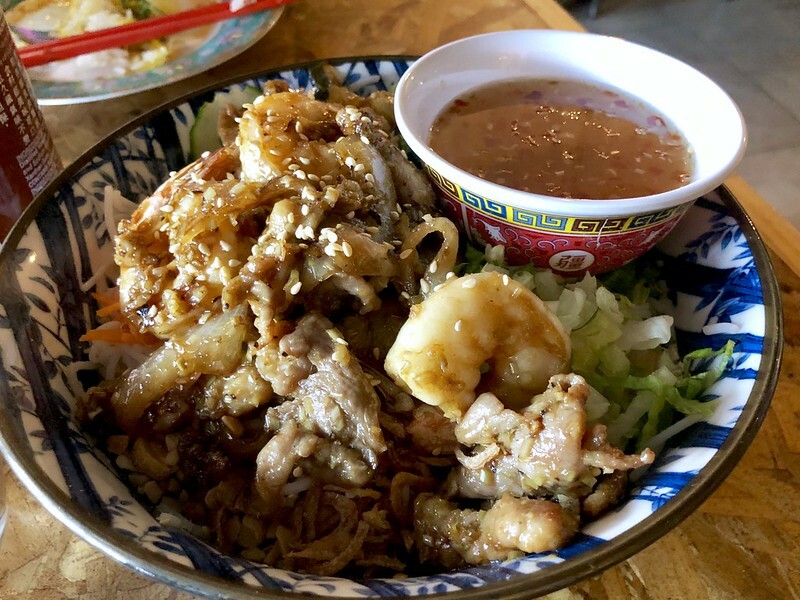 BR wrote: But for those of you who love real Szechuan food and find yourself in the area (Indio is just east of La Quinta), make your way to Cie! cool! We won't be staying in area but I don't care, we'll drive. Heading to the Palm Springs area this weekend for a 4 day weekend. 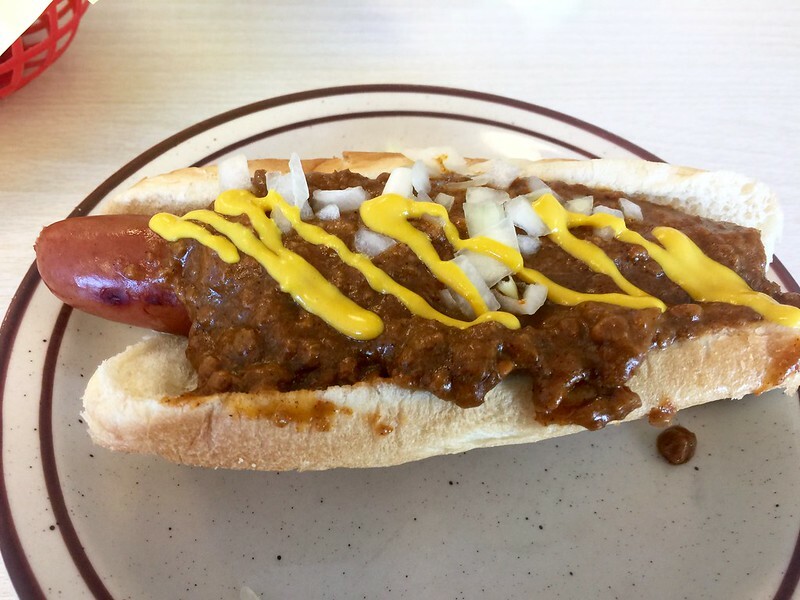 BR wrote: In the last year, I've learned that I love Detroit coney dogs. I've tried both Lafayette and American in Detroit and thoroughly enjoyed both. Well, I recently realized that there's a place about 10 minutes from my parents' home that sells them, Bobby's Detroit Coney Island, in a strip mall in La Quinta right on 111. So I gave them a try. The burgers are nothing special. So we did end up dining at Cie, food was top notch, real deal Szechuan. Service was completely a wreck, in fairness a few items caused this overload: a local fair in Inido had ended so plenty of folks from there walked in, numerous people didn't get that Cie was Szechuan and not a "traditional" westernized Cantonese (we overheard a number of tables mention "no eggrolls, no sweet sour pork" etc) so these tables were a pain for the server to take an order from as it was 50 questions before the order was finalized. Lastly blame the restaurant themselves as they continually sat people when they in no way had the capability to serve them as well as took phone orders. I fully understand that the restaurant business is not easy and they have to make bucks while the iron is hot but the delays in service were agonizing, so much so that people would simply get up and leave after not even getting a menu for 15/30mins. A table of 6 were present when Mrs Willie & I walked in, they weren't able to place an order for nearly an hour. Fortunately we were seated in a booth 10' from the kitchen so wait staff were passing by us frequently and as a result our experience wasn't as bad as other tables. Cie was out of the sliced chicken in chili oil so we ended up ordering to start the pork bao & cold dressing clear noodle that BR had ordered up thread. Both were excellent, some good ma la happening with the noodles. Our mains were the lamb with toothpicks, (no doubt a stunning dish, terrific) as well as the stir fried pork belly. Pork belly dish was good but belly itself was sliced very thin, I would have preferred a thicker cut. Not BYOB, TsingTao beers are $4.25 per. For breakfast tried an oldie as well as a new place. On another morning tried to get into a place called Wilma & Friedas https://wilmafrieda.com but on this busy President's Day weekend, place was packed with 30 minute wait which is not something I'm willing to endure for breakfast. Turns out we had parked our car near Cafe des Beaux-Arts and they were serving breakfast so we went in. Glad I didn't steer you wrong Willie! I just got from a quick visit to the parents. My first stop though was Tyler's Burgers. It's a pretty simple concept with covered patio seating and a short drive from the Palm Springs airport. The place draws a crowd for a reason. Really solid burgers and good sides too. You're likely to find a line but don't fret, it moves along at a solid clip. And although we often don't make it to Palm Springs (my folks are about 35 minutes away in La Quinta), we decided to try Rooster and the Pig one evening too which bfolds mentioned above. This place is incredibly popular but by arriving shortly after opening, we avoided what otherwise certainly would have been a long wait. Overall, I was mildly impressed with the food -- much better than most restaurants in the area, but most of what I tasted I've had better in Chicago. 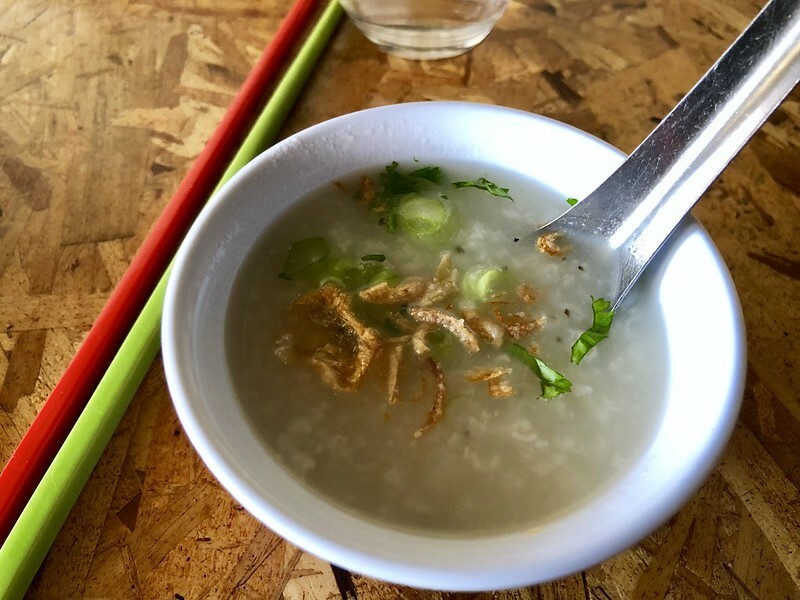 Things got off to a really good start with the complimentary congee that comes out right after you've ordered. It was fantastic, one of the best things we had. I was also a big fan of their fresh spring rolls. This particular version featured both lemongrass pork and dates, a really clever addition given the abundance of dates in the area. And they were delicious. The crispy, fried spring rolls were decent. 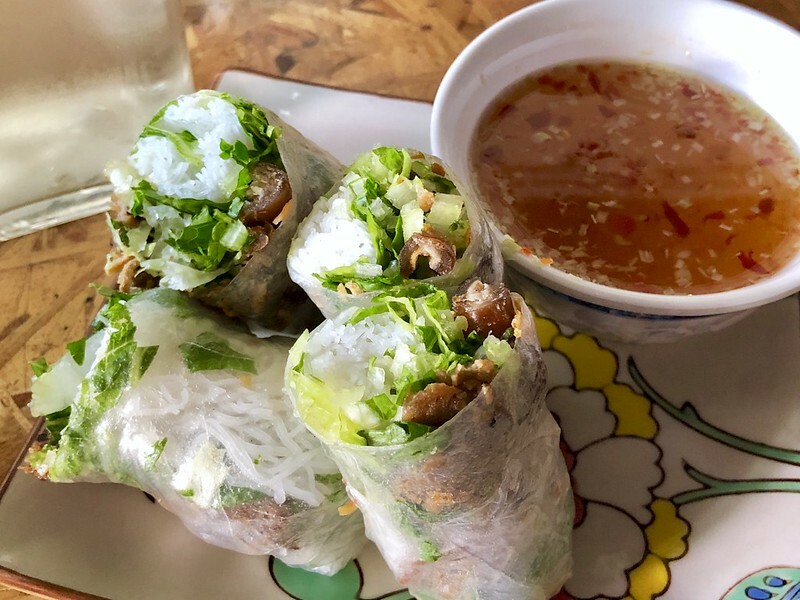 But instead of being served with fresh herbs and large lettuce leaves for wrapping as is typically the case at Vietnamese restaurants, they were served with a mere side salad of sorts. Fine but disappointing given what I expected. 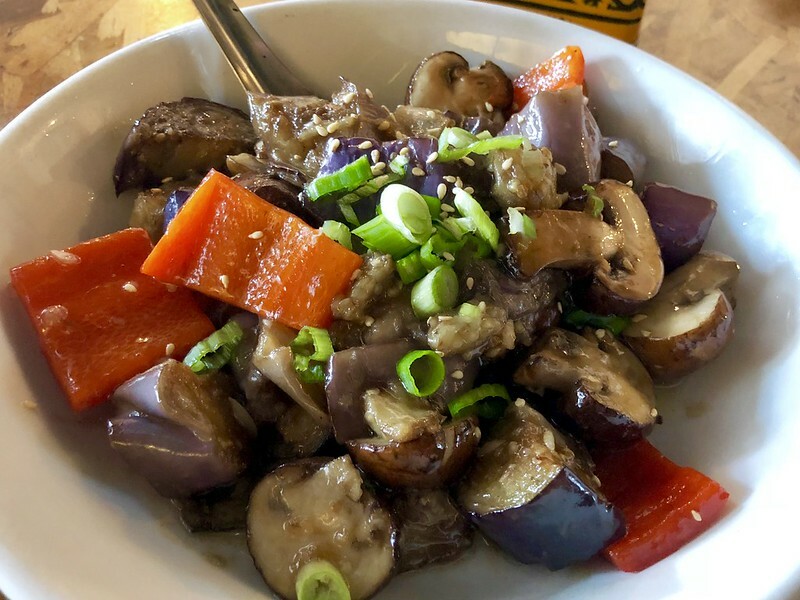 The only real clunker this evening was a sauteed eggplant dish, which also featured mushrooms, red bell pepper, scallions and garlic. It was very under-seasoned, the eggplant was sauteed too long making it pretty mushy, the mushrooms were cut too large and not cooked enough. It's the kind of dish that makes you feel good about your own at-home failures. But back to positives, F.O.B. (Fresh off the Boat) featured crispy, very lightly battered cod that was gorgeous and not the least bit greasy in a sauce of dill and turmeric. Sadly, it's covered by cellophane noodles in my picture so you can't really tell how pretty it was. The cod was perfectly cooked and delicious, though perhaps a tad too sweet and I wouldn't have minded a little more dill. Still, a wonderful dish. Finally, lemongrass pork and shrimp with rice noodles, peanuts, herbs and shallots. The pork was a tad dry and I would have liked a little more herbs, but otherwise tasty and pretty much like what you'd expect to find at most Vietnamese restaurants. Of course, I would have appreciated a little more creativity too since Rooster and the Pig bills itself as something a bit more unique. Rooster and the Pig used to offer ice cream for dessert but apparently the person who made the ice cream left and opened up her own ice cream place on the outskirts of Palm Springs, Kreem. So we headed here for ice cream after dinner at Rooster and the Pig. I tried both the lemon meringue and coffee ice creams and both were excellent. My lone complaint would be that they're serving the ice cream at slightly too cold a temperature. Shield's Date Garden is a really short drive from my parents' house so we went there to pick up some dates . 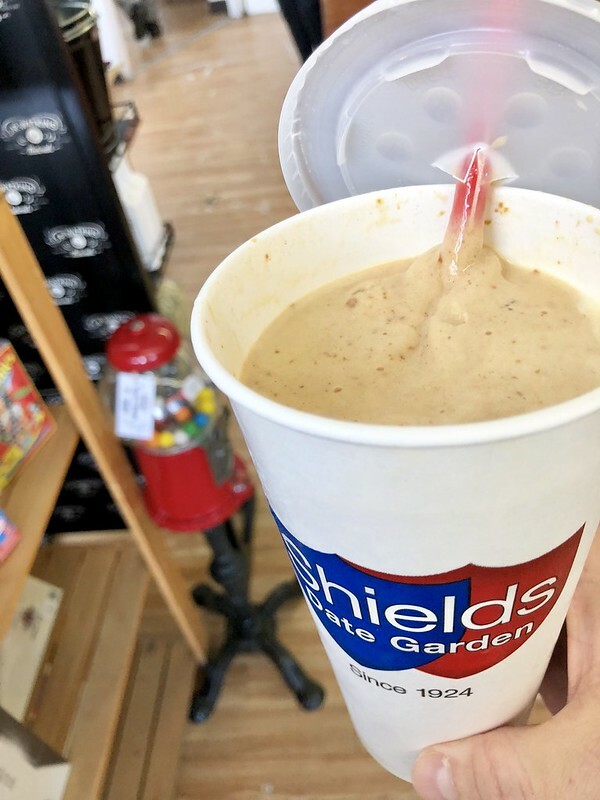 . . and date shakes of course. These are always a must for me. Finally, and even closer to my parents, Old Town Coffee Company in La Quinta, which I mentioned upthread. I'm a big fan of their coffee and baked goods (outstanding muffins heavy on the top, but appropriately served with the stubs too . . . because as you've learned from Seinfeld, there is no other acceptable way). They also serve a terrific lox sandwich on respectable bagels, though they don't make the bagels themselves. There was also some home cooking involved, and a couple of meals not really worthy of mention, but I'll spare you the details. BR wrote: Glad I didn't steer you wrong Willie! Steered me right again BR, the lox and bagel was a delicious way to start the morning this morning at Old Town. I recall the lox & bagel being good at Michael's in Cathedral City but that was many years ago that I went there. 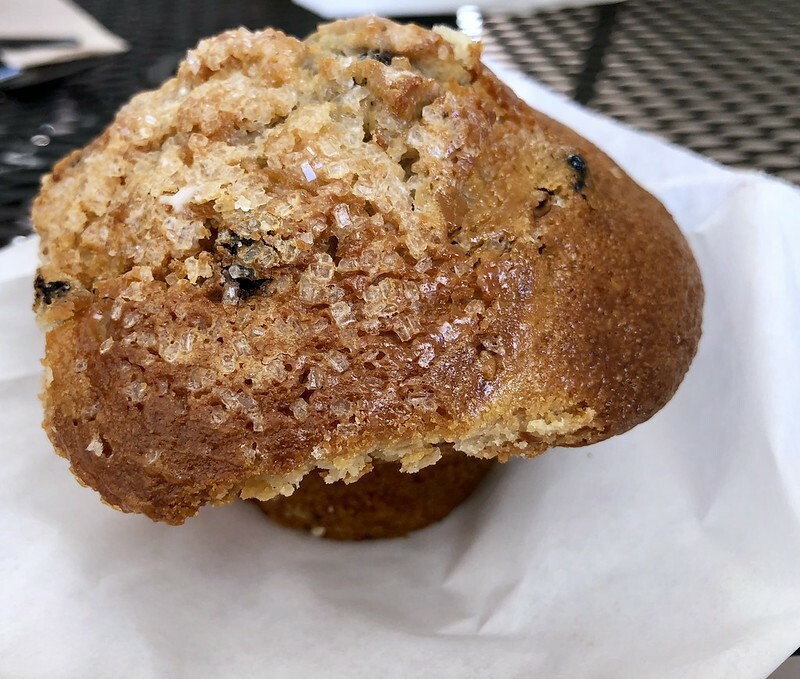 I found the muffins to be ok at Old Town, certainly much better than average, the bran being the best of the bunch. Two things I love about the muffins: 1) overfilled, so huge muffin tops; 2) no liners . . . if you didn't love them, you might just have hit them on a slightly off day. I haven't found better at a commercial joint. My favorites are the blueberry and cranberry-walnut, though my mom always goes for the bran.